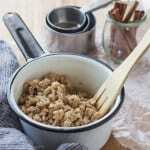 You’ll find yourself using this Basic Streusel Recipe over and over again! It’s so simple to make, in just one bowl, and it’s great on everything from muffins and breads, to pies and fruit crisps. 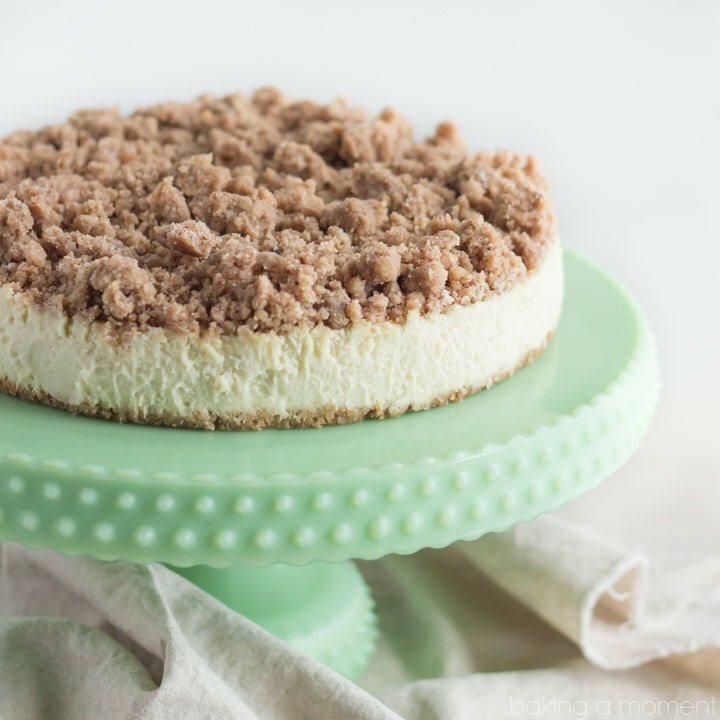 This buttery, sweet crumb topping is sure to be a favorite on all your best homemade baked goods! Yes, you read that right. This is a recipe for streusel. Just streusel. Only streusel. I know it may sound a bit strange to devote a whole post to crumb topping, but the thing is, I just recently realized just how often I find myself referring back to this simple formula. It’s easy. It all happens in one bowl (or pot, as it were). No big clunky food processor with tons of pieces to wash. You don’t even have to get your hands dirty! You don’t have to bake it. You can- but if you want to put it on a no-bake type situation, or an already baked type situation, just stir it over medium-low heat for a minute or two, to cook out the raw flour taste. It’s versatile. I use this buttery crumble topping on everything from muffins and breads, to fruit crisps and pies, even donuts! It’s customize-able. Putting this on a berry dessert? Sub out the cinnamon for citrus zest. Want something a little lighter and more subtle? Use white sugar instead of brown. Want to add some substance? Try adding oats, chia seeds, and/or nuts. 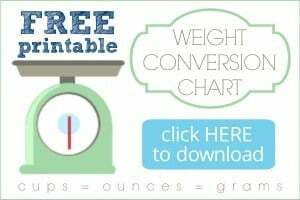 My hubby and kids love when I add walnuts or pecans to this. They give it some added crunch and a toasty flavor that’s just so warm and homey. It’s all as easy as melting a bit of butter and adding flour, sugar, and salt. Throw in some cinnamon too! You can go with as much or as little as you like. When I’m making something like pumpkin bread or apple pie, I’ll add a lot of cinnamon- two whole teaspoons. This time, I chose to keep it a little more subtle with just one. Toss it all together with a fork until the ingredients are evenly dispersed. I like when there’s an even mix of big, boulder-like hunks and smaller, finer crumbs. Stir in the remaining ingredients with a fork, until evenly distributed. * Enough to top 18 muffins, one loaf of bread, or one 8x8-inch cake. Allie, I love this! so smart to share a basic streusel recipe!!! and love all the recipes as well!! I need to make those blueberry muffins!!! this summer!!! love! Those blueberry muffins are outrageous! Every time I make them I can’t believe how good they are. I hope you do get a chance to make them. Thanks so much Alice! It wouldn’t be fair for me to judge because I pretty much did just that 😉 So happy you like this Sarah! Thanks so much for the sweet comment! Yay for streusel! Streusel for breakfast, lunch and dinner! Wow… I really love streusel :). I think it’s a GREAT idea to give it it’s own recipe! Great job, Allie! Thank you so much Heather! I really love it too and I know it’s kind of strange to take pictures of a bowl of streusel but somehow it just made sense to me! Thanks so much Taylor! I feel the same way and I may or may not have done just that! I do too Medha! This is a good one to keep in your back pocket. Thanks so much dear! This is a genius post Allie! I mean who isn’t obsessed with everything struesel topped??? Love that yours is SO versatile and easy as pie! I want a bowl of this sprinkled over some cereal for breakfast. Or 86 the cereal, and just this struesel with a glass of milk. 🙂 yum!! ♡ Cheers! Now why have I never thought of streusel topped cereal before??? Thanks so much Cheyanne! Awesome idea for a post Allie! 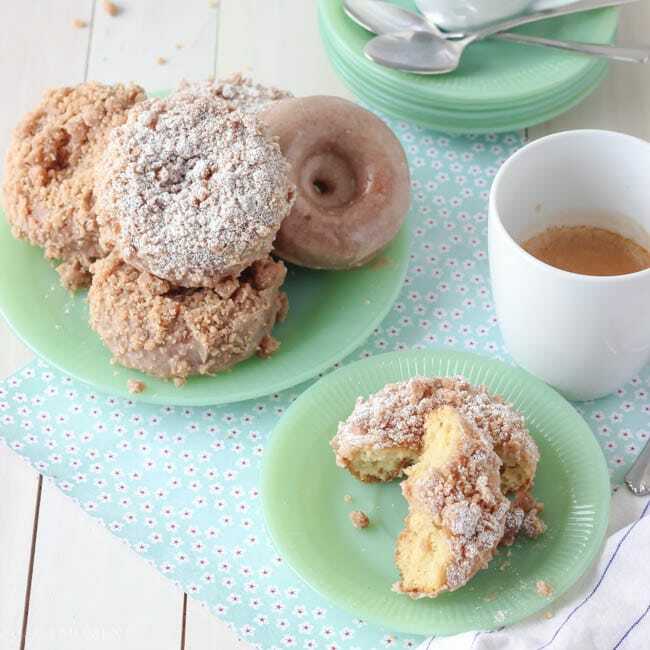 I know my summer is filled with recipes that include streusel! I agree with Cheyanne! I could just eat the streusel out of a bowl! It’s so good! My pleasure Katalina! I hope you love this as much as I do! This looks so buttery-licious with a perfect crumble! Maybe I’ll have to pick-up some berries to have with my streusel! HUGE fan. 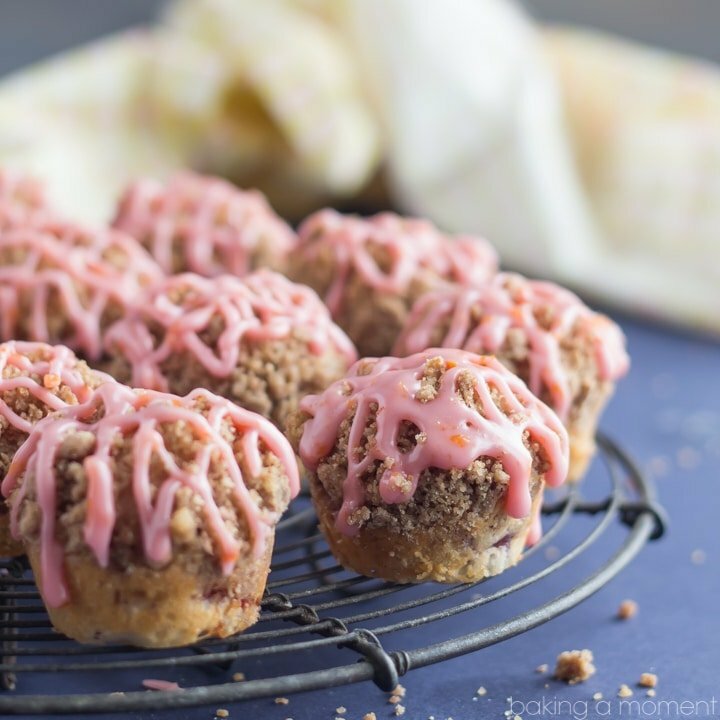 I’m always experimenting with different streusels, and I am totally trying this one out next! I hope you enjoy it as much as I do! Once I discovered this method there was no going back 😉 Thanks Sarah! Allie, I love this recipe. I’m a fan of streusel and that’s my only reason to enjoy coffee cake 🙂 Glad you share this recipe and I can’t wait to try this one. Totally with you Linda! The streusel is the best part of the coffee cake! Thanks so much hon! This is a versatile recipe dear!! Love it!!! What a fabulous idea Allie! I adore streusel but certainly don’t have a go-to recipe. I can’t wait to try this! I think you will love it Jessica! It’s so easy and you can really make it your own. Thanks sweetie! Streusel is my FAVORITE Allie! This one looks absolutely perfect! Pinned! Isn’t it so good?? So happy you like this Trish! Thanks for pinning! You’re not the only one Ashley! It’ so tempting! Thanks so much sweetie; hope you’re having a great week! This is genius Allie! I’m always referencing other recipes just for the streusel part. Lovely! Thanks Kelly! Hope you are having a fun week my friend! YUM, I love a good streusel recipe (I always end up having to increase the recipe because I “sample” so much while I’m making it). Love this! Um ya, that’s totally me too. This recipe makes a bunch, for that very reason! Thanks Sam! so thatssss what streusel is made of! i love this stuff – its so good on top of muffins!! Totally! And donuts! And pie 😀 Thanks so much for stopping by Beverley! Haha right! Thanks so much Jen! This is so easy to make and I love how versatile it is. Streusel for all! Hooray! Thanks so much Chineka! I can, and I totally did! Lol! Same here Manali and thank you! I honestly love streusel on any fruit – apple, peach, pear, plum etc. What a wonderful idea to have a go to recipe for the streusel. Thank you, Allie! My pleasure Marissa! And so do I! 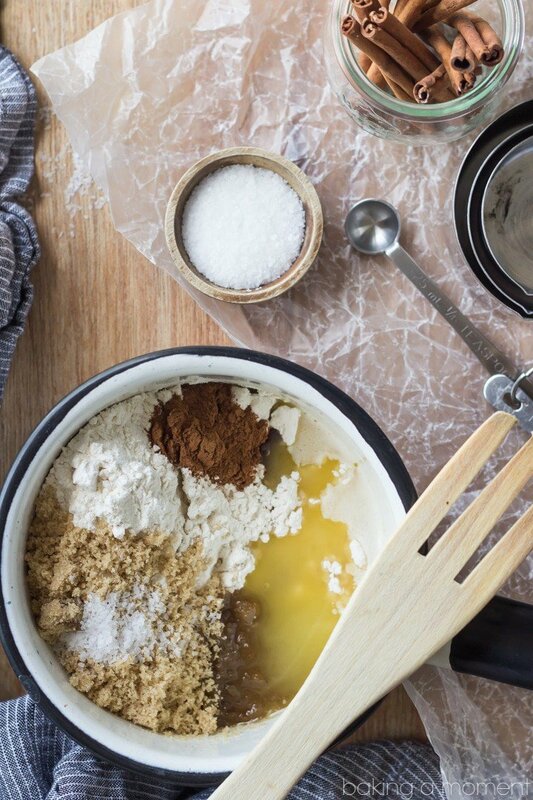 This streusel is calling my name before it’s even baked. 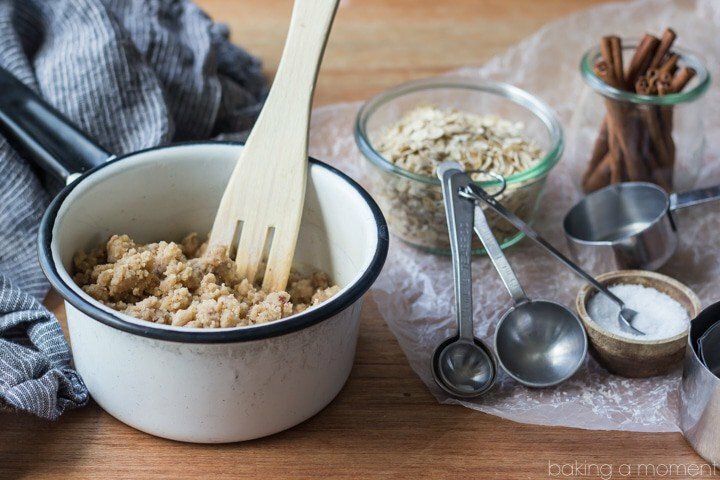 I love thick crumbly streusel and this recipe looks like the perfect addition to baked goods! Thanks Ashley! I don’t even need it baked tbh, it’s so good as is! Thanks for sharing this, Allie! It sparks so many yummy ideas and possibilities! Yay! So happy you like it Tori! So do I Emanuele! Recipes like this are my absolute favorite. Thanks for sharing Allie ! Love it! 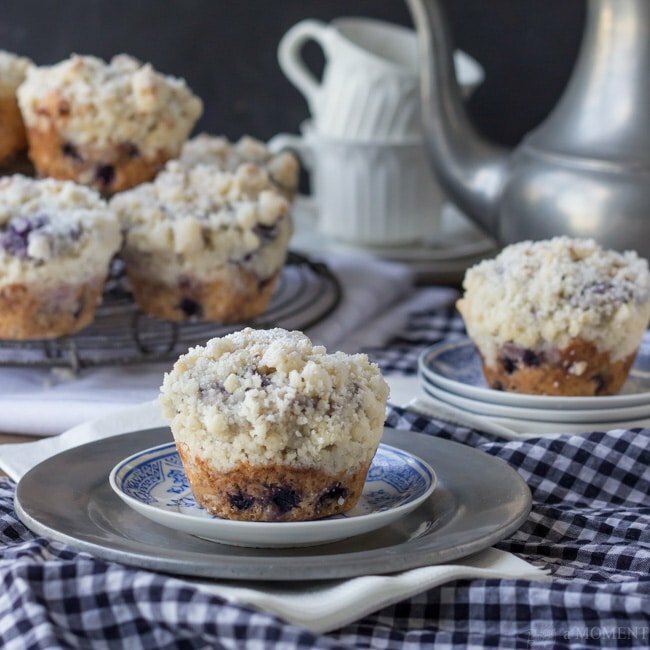 Need to make some blueberry muffins with streusel topping! My favorite! Hope you enjoy Mira! Oh my I love me some streusel!! If it was up to me, I’d take my crumb cake with double the streusel and half the cake. This recipe could be dangerous… Yum!! I totally feel you! The streusel is definitely the best part of the coffee cake! Thanks so much Jen & Emily! Girl…streusel away! 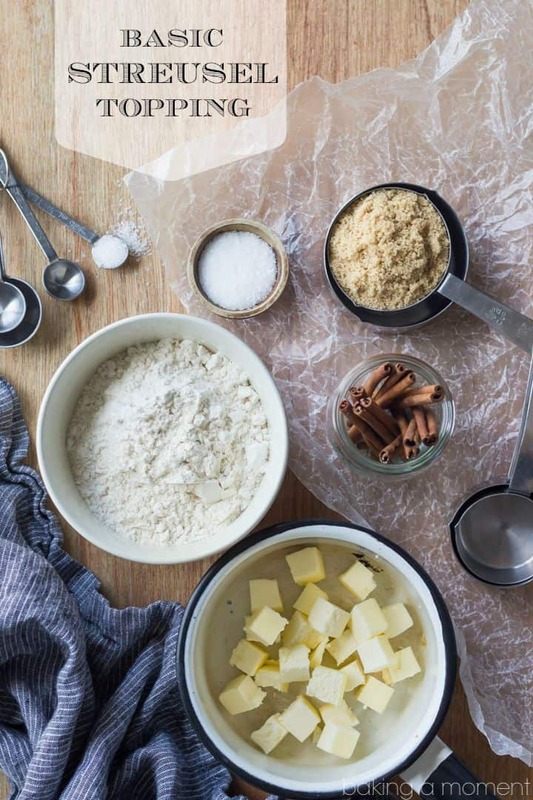 An entire post devoted to this wonderful crumble topping is certainly in order. This recipe is fantastic! I’m going to put it on muffins, on my yogurt, cakes… the possibilities are endless! Yes! There’s tons you can do with it. I hope you enjoy the recipe, Kathleen! Thanks so much dear! Awesome! I hope you like it as much as I do, Jess! That was me for the longest time! So glad I’m not along on that. Thanks so much for pinning Veronica! Cooked some organic fuji apples and thought of this recipe I had bookmarked and never gotten around to making. It was a perfect topping for the apples. Question about storage. Does this need to be refrigerated right away or can it be stored for a short period in an air tight container? I’m so glad you enjoyed it Judy! That’s a great question and I have to admit, I’m not always super careful about stuff like that. One of these days I’ll probably end up regretting that, lol! But I have kept it at room temperature for several days and haven’t had any problems. Just remember that it does contain dairy (butter), so I wouldn’t push it much more than that. I hope that helps! Thanks so much for reading and for the great question! Can this be baked by itself? Any suggestions on the best way to do that and not burn it? I have a cake that I will frost and want to do just a little struesal “decoration” on top of each slice just to make it cute. It absolutely can Rebekah! I would just spread it in an even layer on a parchment lined baking sheet and give it 10 minutes or so at 350. But honestly I don’t mind eating it as is either! Hope this works for your cake- it sounds delish! Ummm yum! OK but it said something about cooking it longer to get the flour taste out if using it ‘raw’… Help! Hey Samantha! Could you be a little more specific with your question? How can I help you? You’re not a pain Annie! Not at all! I bake it on top of pound cakes all the time and it’s totally fine. But if it looks like it’s starting to get a little too brown, you can just cover it loosely with foil. Hope that’s helpful! Can you bake this on a sheet pan? I wanna use it to sprinkle on already done cheesecakes. Glad it worked out well! Adding more butter if it’s dry is definitely the right move! Thanks Juliane! Hey Kathy! No it’s not really crunchy, only on the tippy tops and edges. It’s got kind of a sandy texture underneath. That maybe sounds weird but it is really good! I’m going to be making this recipe tonight to top some blueberry mini muffins and I’ll let you know how that turns out. I’ll also be posting it to my Facebook page and perhaps my own blog with a link to yours. My question is, is this a recipe that you could make before hand and keep it on hand for different recipes throughout the week? I am not a baker or a cook, but, I assume if I did try to do that, it would need refrigerated because of the butter. Thank you very much for posting this, I can’t wait to try it! Hi Erika! You can absolutely do that and yes the fridge is probably a good idea if you’re storing it for long stretches of time. Good luck and I hope you enjoy your muffins! I’ve been forever searching for a copycat recipe for my favorite chocolate cake from my childhood. It was a box mix – Pillsbury I believe – chocolate streusel swirl bundt cake. I’ve tried a couple things but haven’t yet come close. This looks like it’s worth trying, but how much cocoa should I add/subsitute to the recipe to make it a chocolate crumble ? Hey Sharie! You can find a chocolate version within this post: https://bakingamoment.com/baked-chocolate-crumb-donuts/. Hope it’s as good as you remember!